As I continue to discover what my body will and won’t do, we pushed the limits yesterday by attending two giant expos, the Marathon Expo and the Home and Garden Show. I was holding up pretty well and enjoyed trying some of the demonstration items like massage chairs and home exercise equipment, when I came across THE WIGGLE CAR. It’s a small plastic sit-on toy that is sized for children, but the salesman cleverly posted, in large letters, that it will hold up to 300 pounds. It looked like great fun and the salesman was very happy to let me try it. The hugest challenge was that it sits about 4-5 inches off of the ground and I wasn’t real sure I was going to get all the way down to it, and if I did, I was also concerned that it would slip out from under me at the last minute, leaving me to crash my bionic pelvis onto a concrete floor. I just took my time and slowly worked my way down to the ground. There were about a dozen people watching and I simply didn’t care. I could have hurried so that I didn’t look so old or decrepit, but I have learned to protect my body over my ego as it is far more fragile. 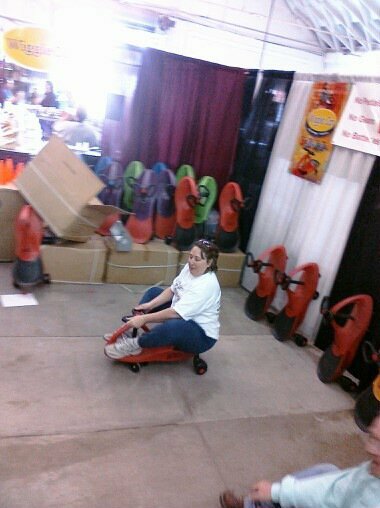 And, what a surprise, no stranger at the Home and Garden Show yelled, “Hey Grandma, get off that toy!” Quite the contrary. Adults watched with fascinated attention, and several others joined me, including a silver-haired woman, a tragically cool Goth teenager, and, by that time, a fairly intimidated 8-year-old boy. It was so much fun. I really loved it. I rode it for far longer than would probably be considered a “polite” amount of time, but the salesman could attract more attention to his booth if people were riding these things, so as long as he encouraged me to stay on it, I did. Never even occurred to me that I might have to buy one, I hadn’t gotten as far as thinking of what would happen if and when I ever got off of it. But, off of it, I did get. I asked about the price and walked silently away from the booth, slowly considering whether or not I was going to try to pry $45 out of my tight-fisted husband’s wallet. Having been married 10 years, I knew how the discussion would go, so I argued his part in my head for several minutes, slowly coming to the conclusion that I would not, in fact, ride that thing more than 2-3 times a year and that we’d have to find somewhere to store it in the meantime. I came to realize that the car itself, although fun, was probably not the best purchase I could make. However, what I was really attracted to was the fact that I was having physical fun. I never lost my sense of humor throughout this recovery, but I did lose the ability to jump and run and bounce and dance and twirl and hop and skip and slide and climb and crawl and roll and do cartwheels, all of which I did on a somewhat regular basis, despite being 40 years of age. Riding this Wiggle Car was the first real physical fun I had had in a very long time and I just didn’t want it to end. 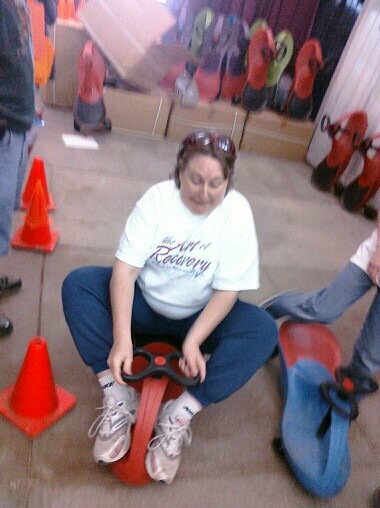 I told myself that if I continued to recover, I might once again be able to be more physical and that I didn’t need a Wiggle Car to do it. What I needed was perseverance to keep up with my Physical Therapy for as long as I took and the mental commitment to doing various maintenance exercises for the rest of my life. For starters, today we are going to try hiking. We’re going to drive 60-90 minutes to the Superstition Wilderness, a place we both love to hike, with the idea that I will hike for as long as I can, and I even bought trekking poles to help. When I call quits, that’s it, we leave, no questions asked, no pushing or cajoling. And, if we drive an hour to hike 25 minutes, that’s what we do. At least it’s a start!